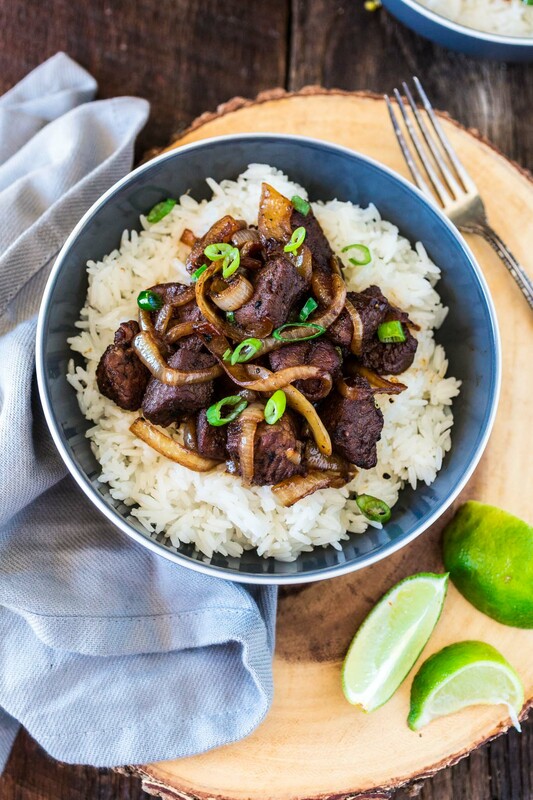 Bo Luc Lac is a flavorful Vietnamese dish consisting of cubed beef, garlic, soy sauce, lime juice and sliced onions. Quick, convenient and very easy to prep thanks to Dorot! To say life has been upside down is an understatement. For the past month, my husband and I have been through so much and we are feeling a bit overwhelmed. I’ve been trying to keep up with the blog, but as you may have noticed, I fell behind a bit. I was still cooking at home most of the time, but unfortunately Mc Donald’s trips happened more often than I’d care to admit. 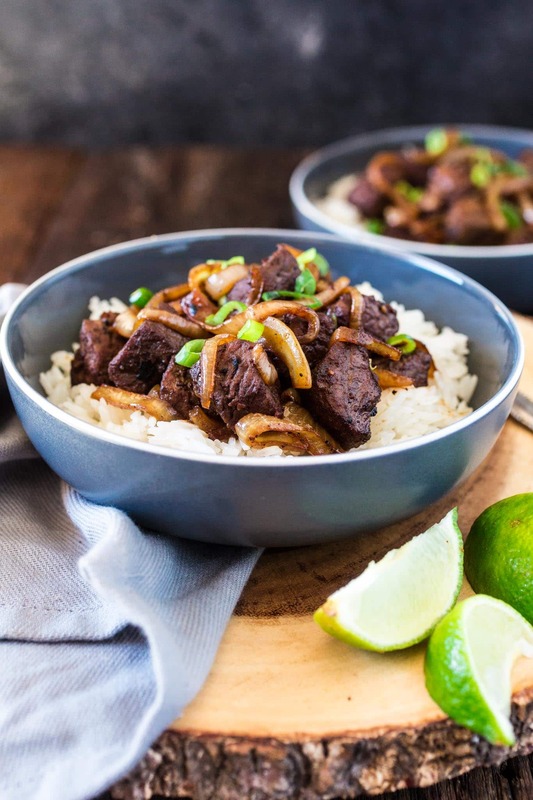 Thankfully, this past weekend I was feeling slightly better and I managed to put together this delicious Vietnamese inspired meal: Bo Luc Lac, or Shaking Beef when translated to English. 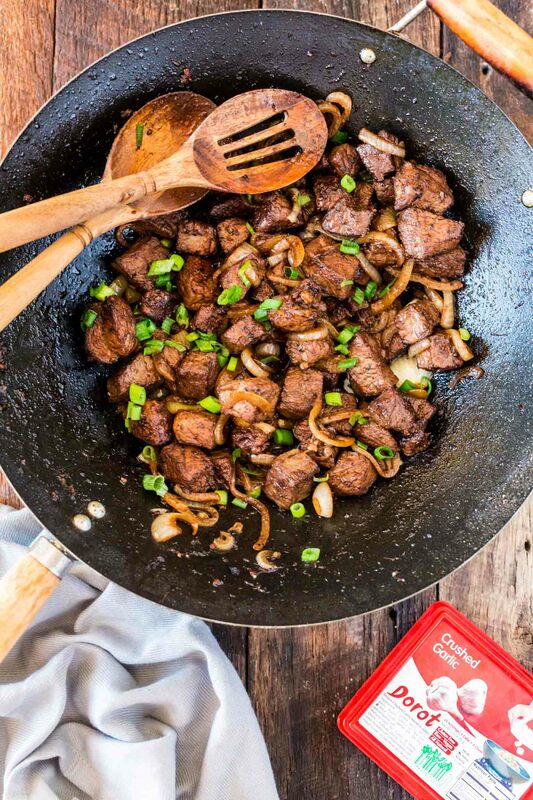 That name comes from shaking the wok pan while cooking the cubed beef to perfection. Don’t get me wrong, I do love cooking. But my cooking mood is intrinsically tied to my overall mood, so if I’m feeling a little blah it is hard to get out of bed to prep a meal and even harder to clean up after cooking! I usually have Tim to do the cleaning, but since whatever is happening is affecting both of us, the kitchen has been looking a little like a war zone (to say the least). So, given those circumstances, I am VERY glad for Dorot and its chopped herbs and garlic. I used their Crushed Garlic for this meal and that saved me so much time and energy! These products are also very convenient for winter cooking, when fresh herbs are so hard to come by. So how does that work? First, Dorot starts by growing their own garlic, basil, cilantro, parsley, chili and ginger. At peak freshness, they pull the products from the fields, process and flash freeze into their convenient trays within 90 minutes of harvest. With a two year shelf life, you can have fresh garlic, onions and herbs year round with a simple “pop” of the tray. Oh yeah! When they say “fresher than fresh” they really mean it! The trays are also pre-portioned, which makes it effortless to season and flavor your cooking. 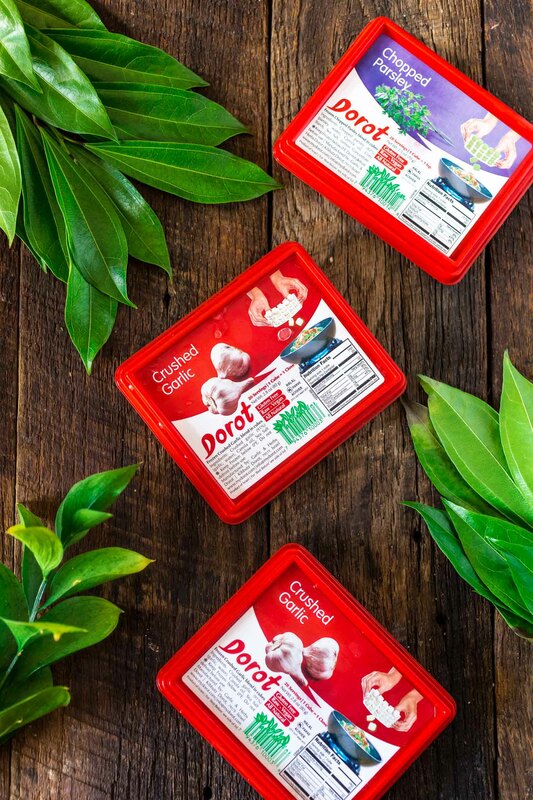 Believe me, if they motivated me to cook a delicious home cooked meal instead of ordering take out, I am sure you will feel inspired to create a gourmet creation with Dorot! 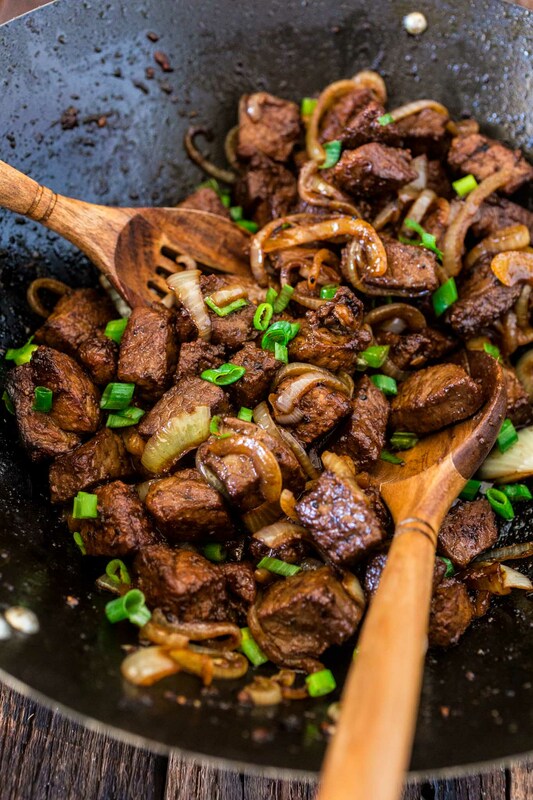 I consider this Bo Luc Lac to be a step further into my Asian cooking experience. I am loving playing with Asian flavors and they are always a hit at our home! I hope you guys enjoy it as much as we did. We served it over rice and with a simple green salad on the side! So delicious! Don’t forget to grab this coupon so you can try Dorot herbs and/or garlic. In a large bowl, combine the brown sugar, soy sauce, lime juice, 8 cloves of garlic, salt and black pepper to taste. Do not go crazy with the salt, as the soy sauce is already salty! Add the beef and let it marinate for 1 hour. Preheat a large wok over high heat. Add the vegetable oil and, when simmering, add the remaining 2 cloves of garlic. Once fragrant, add the beef cubes, working in 2 to 3 batches if needed. Sear on all sides, shaking the pan, until medium rare, 1 to 2 minutes. Remove the beef to a plate and reserve. Toss the onions in what's left of the marinade in the bowl. Add the onions to the wok and sauté until soft and beginning to brown. Add the beef (and its juices) back to the pan and toss with the onions. Remove from heat, sprinkle with sliced scallions and serve over rice or salad. Do i just dip the inions in the marinade or I put the onions and include the marinade when I put the onions bagk in the pan? I just quickly toss them in the marinade and then remove and add them to the pan. You can add the marinade to the pan but then you might need to saute for longer until the onions begin to brown. :) I hope that helps! Did you really just give it one star because of this when SIRLOIN is clearly listed? Fail. Leaving a one star review because they didn’t know what sirloin is, how unfair and what horrible attituce. This recipe is delicious!